Personal Consulting & Coaching | StatsWhisperer | Statistics Training, Books, Videos & More! Please email Dr. William Bannon ([email protected]) to check on the availability of consultation hours. Rates may vary by project, but typically the rate for academic consultation starts at $250/hr. and the rate for corporate consultation starts at $350/hr. StatsWhisperer takes a special interest in working with students who are often learning the fundamentals of statistical research through completing a thesis, dissertation, or an equivalent program requirement. Subsequently, we have set aside a limited number of consultation hours that are available at a special student rate, which is approximately half the usual academic rate (50%) to make services more affordable for students. Hours may be retained in 8, 16, 24, and 32 hour blocks. I highly recommend William Bannon. I contracted Dr. Bannon to work with me as a statistical consultant on my research as I worked toward earning my DNP. The quality of Bill’s work was exceptional. I felt entirely confident in his knowledge and expertise in research methods, statistics, and analysis. His analysis was very thorough and he produced exactly what I needed to answer my research questions. His write-up and summarization of my findings was excellent, with an appropriate integration of text and supporting tables. Bill was always available to me, very responsive, and was great with follow-up. The way in which Bill explained all of the statistical methods he used and the results of the analysis was clear and understandable. Bill was a pleasure to work with – always pleasant and sincere, with a great positive attitude. Even in the final hours pre-defense, he was available for support and questions. I am sure he would be an ideal asset to anyone needing a methodological or statistical consultant for their dissertation or research project. I certainly plan on continuing to work with him regarding future research projects. Please feel free to email Dr. William Bannon ([email protected]) to check on the current availability of hours at the student rate, as well as discuss your research project. Students may retain blocks of time at the special student rate below. 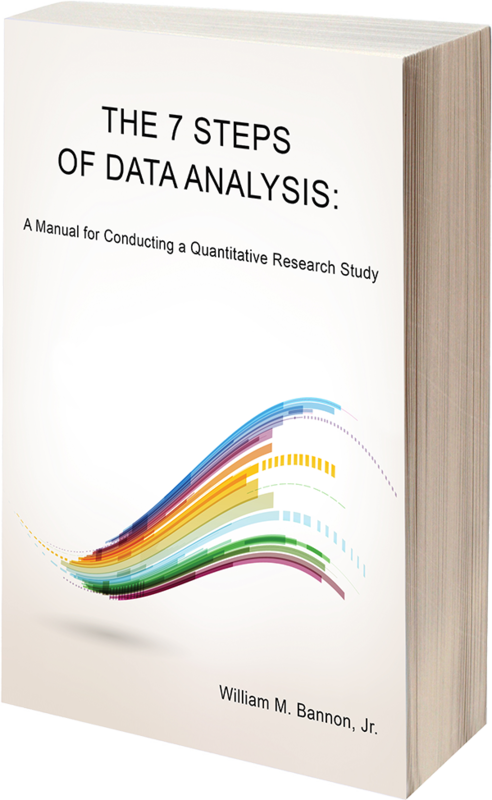 The primary purpose of this book is to empower the user to conduct a legitimate and effective data analysis project (a quantitative research study) from the point of conceiving of a research question, through statistical analysis, and to the completion of the project in a professionally formatted manuscript that presents the study results.